Caption Contest.. Seal your fate... - You don't know me. Either way, that is hella creepy! And right!?! LOL. I love it, but whoa! I wouldn't be surprised if he graces a nightmare or two in my future. 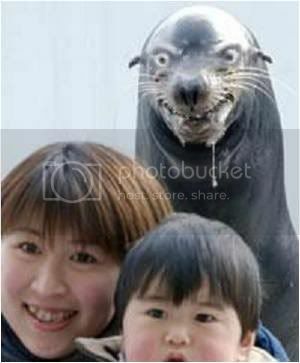 No idea but omg rabid seal! LOL, right!?! I'm guessing it's photoshopped, but if not.. yikes! I agree. He's like rabid.